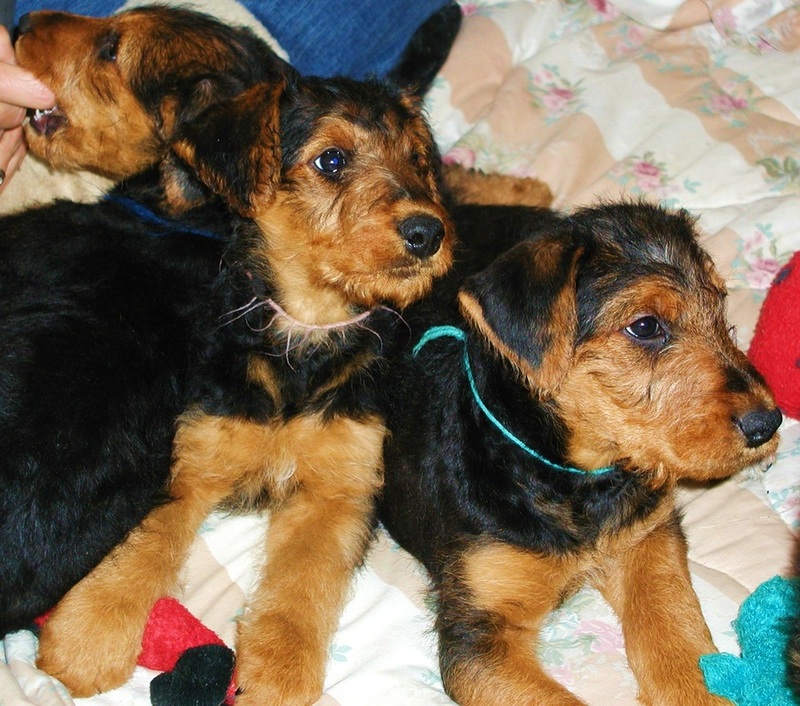 Interested in adding an Airedale from Rock Ranch Family Airedales to your family?? ​* Please scroll to the bottom of the page and fill out our contact form! Quality temperaments, conformation and bloodlines! application with your new puppy. Price: 2018-2019 Full AKC Airedale Male or Female Puppy: $1400. ~ Prior to pick up day, you will receive DETAILED advice regarding needed supplies and answers to your every question. You will feel confidant and prepared. ~ Your Puppy will come with puppy food and recipes to get you started, a puppy collar and leash, a companion toy and other goodies. ​~ AKC registration application and a detailed Puppy Care Booklet with all you might need to know about puppy rearing! ~ You will also receive a signed receipt and Puppy Guarantee. 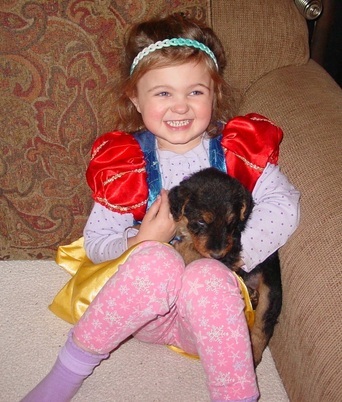 Additionally, you'll receive training emails and email tips from us from DAY ONE of your new puppy coming home! of your dog. We are available for your questions and needs, and we WANT to hear from you and receive updates! Your puppy purchase also INCLUDES one free grooming session and 2 free live training sessions! ​ phone / email support. We thank God for the opportunity to offer these amazing pups for your family's pleasure and peace of mind. If within 2 weeks of purchase, a qualified veterinarian deems your puppy has a health issue, with the veterinarian's health certificate stating such issue we will GIVE FULL REFUND for the return of your puppy. ​If within 2 weeks for ANY reason at all other than a veterinarian's certificate of health issue, you determine that you cannot keep your puppy, you may return the puppy to us for a refund, minus $200. re-homing fee. (for both the new family and the puppy) is of extreme importance to us. It's as easy as 1, 2, 3, 4 ! ​ ensures that we have loving families anxiously awaiting the arrival of each puppy to their new home. YOU WILL RECEIVE A WRITTEN RECEIPT for your Puppy Reservation Deposit if you send a check. 2) Please FILL OUT THE CONTACT FORM below... including Family info and your work status ie: who will be home to care for Puppy? Also, allow us the opportunity to do a phone consult with you and your family. according to your lifestyle and your reasons for wanting an Airedale. 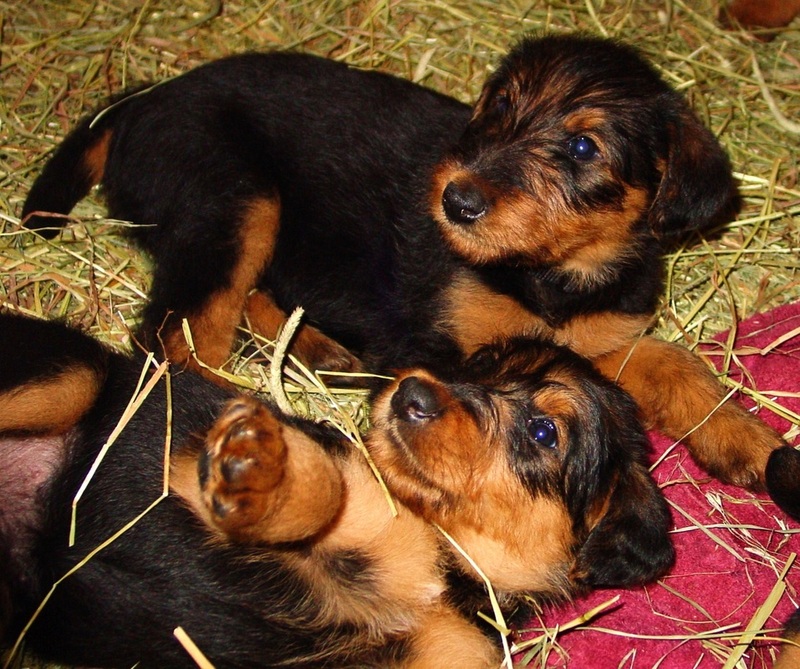 3) You will receive email updates and photos throughout the birth and growth of your puppy! 4) Puppies will be ready to go to their new families at approximately 8 - 9 weeks of age. ​We will have to see what the Lord provides! Quite often when we choose to breed a litter it is because we want to keep a pup for ourselves. Prospective puppy owners will be able to meet the pups after they are 5 weeks old - - however the opportunity to know exactly which pup will be yours MAY not occur until after the pups are 7 weeks of age when we complete our temperament testing. If we do not have an available pup at the time you contact us, your name can be added to our waiting list. We will contact you about upcoming litters and puppy availability. Being placed on our waiting list is a courtesy, it in no way binds you to a puppy purchase. PLEASE fill out our CONTACT Form below to tell us about yourself, your family (spouse / children / grandchildren/ schedule) and your needs! BABY DELLA, BABY TURK ! ... fill out our form below and Please include details about your family in the comments location. ​PLEASE INCLUDE YOUR PHONE NUMBER.